The Libyan war has nothing to do to with humanitarian concerns, a senior member of Venezuelan President Hugo Chavez's ruling party said this week. According to Carlos Escarra Malave, vice president of Venezuela's standing committee on foreign policy, the United States and its European allies "invaded" Libya so they could confiscate $200 billion in frozen assets belonging to the family of Muammar Gaddafi. They "could save their own economies by confiscating those assets," he said. "That's the true reason for the invasion." Malave's bizarre comments serve to highlight the Venezuelan regime's reflexive support for rogue states and its hostility towards the West. But Chavez's burgeoning relationships with Iran and terrorist proxy Hizballah have been a much greater concern for American policymakers and law enforcement officials for years. In April 2010, the Defense Department reported to Congress that the Islamic Revolutionary Guard Corps (IRGC) and the IRGC-Qods (Jerusalem) Force (IRGC-QF is an elite unit within the IRGC) have been increasing their presence in Latin America - especially Venezuela. The two "have been involved in or behind some of the deadliest terrorist attacks of the past 2 decades, including the 1983 and 1984 bombings of the U.S. Embassy and annex in Beirut, the 1983 bombing of the Marine barracks in Beirut, the 1994 attack on the AMIA Jewish Community Center in Buenos Aires, the Khobar Towers bombing in Saudi Arabia, and many of the insurgent attacks on Coalition and Iraqi Security Forces in Iraq since 2003," the Pentagon report said. The IRGC and IRGC-QF generally direct and support "the groups that actually execute the attacks, thereby maintaining plausible deniability within the international community." In 2008, the Treasury Department announced sanctions against "two Venezuela-based supporters of Hizballah." One of them, Ghazi Nasr al Din, who served in senior positions at the Venezuelan embassies in Syria and Lebanon, had "counseled Hizballah donors on fundraising efforts" and "provided donors with specific information on bank accounts where the donors' deposits would go directly to Hizballah," a Treasury statement said. The other, Fawzi Kan'an, "met with senior Hizballah officials in Lebanon to discuss operational issues, including possible kidnappings and terrorist attacks. Further, Kan'an has also traveled with other Hizballah members to Iran for training." "It is extremely troubling to see the Government of Venezuela employing and providing safe harbor to Hizballah facilitators and fundraisers," said Adam J. Szubin, director of the Office of Foreign Assets Control (OFAC). For Iran, Venezuela's established financial system "can help it end run UN Security Council sanctions, and its geographic location is ideal for building and storing weapons of mass destruction far away from the prying eyes of the International Atomic Energy Agency and the international community generally," said former Manhattan District Attorney Robert Morgenthau, who conducted several investigations into illicit banking and financial links between the two nations before his retirement in 2009. "For Venezuela, Iran provides political leverage against the United States by burnishing Caracas's pretensions to leadership of Latin American's anti-U.S. regimes and terrorist organizations." Morgenthau is deeply concerned about Iranian-Venezuelan collaboration in circumventing sanctions against Iranian nuclear weapons programs. In June 2008, Iran opened a bank in Caracas under the Spanish name Banco Internacional de Desarrollo C.A. (BID). It was an independent subsidiary of the Export Development Bank of Iran (EDBI). Four months later, OFAC imposed economic sanctions against these Iranian banks for attempting to provide services to the Iranian Ministry of Defense and its Armed Forces Logistics agency - two military agencies responsible for advancing Iran's weapons-of-mass-destruction programs. Iran and Venezuela claim the BID opened in Venezuela for the purpose of expanding bilateral economic ties. Morgenthau suspects there is a darker motive: Iran hopes to use Venezuela to circumvent U.S. sanctions and gain access to the American banking financial system. OFAC sanctions alone cannot stop this outcome, Morgenthau argued, because Venezuelan banks are not subject to sweeping U.S. or international sanctions that seriously restrict their ability to do business with the United States. That means, in effect, that U.S. banks are forced to rely on the Venezuelan banks that are under Chavez's control to ensure that money is being transferred for legitimate purposes. The Manhattan District Attorney's Office found that Iranian-Venezuelan financial "cooperation constitutes the basic infrastructure for dealings in nuclear technology as well as the narco-terrorist activities in which the Venezuelan government is clearly implicated," Morgenthau wrote. "Our efforts uncovered a pervasive system of deceitful and fraudulent practices employed by Iranian entities to move money all over the world without detection….The Iranian government is going to such lengths for a purpose as simple as it is obvious: to pay for materials necessary to develop nuclear weapons, long-range missiles and sophisticated roadside bombs without being detected." "According to U.S. and Colombian officials, Venezuela has extended a lifeline to Colombian illegal armed groups by providing significant support and safe haven along the border. As a result, these groups, which traffic in illicit drugs, remain viable threats to Colombian security. A high level of corruption within the Venezuelan government, military and other law enforcement and security forces contributes to the permissive environment, according to U.S. officials." According to the State Department, Chavez has repeatedly referred to the United States as a "terrorist nation" and described America as "the first state sponsor of terrorism." During 2009, Venezuela's "cooperation with the United States on counterterrorism has been reduced to an absolute minimum," the State Department reported. 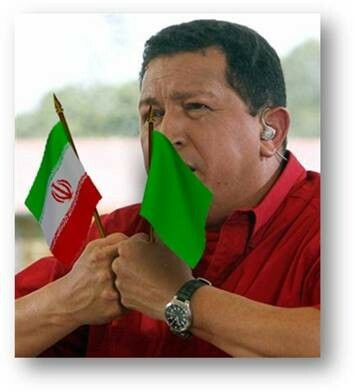 Chavez "continued to strengthen Venezuela's relationship with state sponsor of terrorism Iran," while "Iran and Venezuela continued weekly Iran Airlines flights connecting Tehran and Damascus with Caracas." In May 2010, the U.S. government re-certified Venezuela as one of six countries worldwide that are "not cooperating fully with U.S. counterterrorism efforts" (the others were Iran, Syria, North Korea, Cuba and Eritrea). At that time, according to former Assistant Secretary of State for Western Hemisphere Affairs Roger Noriega, the Iranian and Venezuelan ambassadors to Syria held a meeting in Damascus where they came up with a plan for a secret summit in Caracas. It took place in August, when Chavez hosted senior jihadist operatives, including Khaled Meshaal, supreme leader of Hamas; Ramadan Abdullah Shallah, secretary-general of Palestinian Islamic Jihad; and the chief of operations for Hizballah, whose name is kept secret. Last year, Spanish journalist Antonio Salas published a book, El Palestino, in which he said there are six terrorist training camps around Caracas. Groups training there include Hizballah and the Colombian FARC organization. There had been reports for years about the existence of the camps, but Salas was apparently the first person to provide firsthand documentation. In the book, Salas said he posed as a Venezuelan Palestinian interested in jihad. He joined a Venezuelan "faction" of Hizballah, meeting members of terrorist organizations like Hamas and the FARC. "This is in keeping with Chavez's broader goals of creating an alliance of state and non-state actors to wage asymmetrical warfare against the United States," journalist Douglas Farah wrote. We have one effecyive weapon against Chavez: economic power. We should prove what links we can, expose them and declare sanctions and a general disengagement from Venezuela. We should stop buying oil and other commodities from them. They need us far more than we need them and as long as that is so we have the upper hand. But the upper hand is of no account if you refuse to wield it. What is so hard tounderstand is the support Chavez has in this country by people who are supposed to be for human rights and self-determination for all. Chavez is a dictator in the old mold, but because he is a socialist and because he vents against the United States he is the darling of the elite. It is hard to fathom how such a crude, piggish individual can get so popular, but then jsut look at Castro and Che! There are Che! nighties for kids yet. Too bad no one has come up with Mao nighties with little red stars. Maybe progressive nighties? I'm going to think about that. Progressive nighties. Marx, Said, Sartre, Mao, Alfred E. Newman, Bob, Mohammed, Yasser Arafat, all together at last! While supplies last, friends. This is a country America should invade and remove chavez and his cronies. If he were to be killed; all the better. Chavez is the least worry, See article below.